The Door Peninsula Winery is a feast for the senses. You must stop and shop here - highly recommended by our reviewing staff! Here at Door Peninsula Winery, people can see, taste and smell wine. The business is housed in a restored vintage schoolhouse, where the Door Peninsula Winery brand wines are showcased and sold. We just retoured the faciltiies with Jesse, the marketing director. And the winery keeps winning awards! Just in Spring 2014, they won 3 medals at a Florida International Wine Competition (for their Blackberry Merlot took Gold, while Lighthouse White and Sunset Splash each won a Bronze Medal! They won another three medals at a recent Finger Lakes International Wine competition! The Winery also features a modern 14,000 square foot addition, which was made to the building in 2005. The addition includes Door County Distillery(producing vodka, gin and whisley) and wine bar. But it’s the charming schoolhouse façade that will most likely catch your eye. The 1868 vintage schoolhouse served first through eight graders for nearly 100 years. In 1974, the building was renovated and the Winery was established. Even today, the Carlsville Schoolhouse, transformed as a Winery, is still a place where kids learn. “We welcome children. 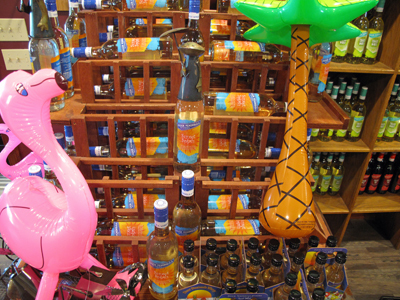 We try to have something for everyone,” said the winery’s marketing and promotions director. A Winery tour is kid-friendly with a “cartoon cherry” host on a short video. The walking tour is kept short in light of limited attention spans and busy vacationers’ schedules and are offered daily year-round. The 20-minute tour includes a stop in the schoolhouse’s basement, which was the original winery fermentation area. During the tour, people also see the lab, bottling line and large tanks where wine is stored. “You have an opportunity to watch as work is going on,” Jesse says. More than 50 varieties of fruit, white and red grape and sparking wines are made here. And about 150,000 gallons are bottled annually. Razzle Dazzle Raspberry is a huge hit! The tour ends in the tasting room, where adults may sample the bounty. Here, a wide range of wines pleases all palates. Wine tastings will cost you $3 per person, and you get a certificate for $3 off a purchase of a bottle of wine. You can taste from a menu of about 20 different wines, from reds and whites to sweets and fruits. Very well worth it - and you will definitely find something you like and make a purchase! A personal favorite of this reviewer is Door Peninsula Winery’s Blackberry Merlot. This is a full-bodied blend that brings together a dry red wine with a sweet fruit wine to make a smooth dinner or dessert wine. We also like the cabs and a white called LaCrosse. One very successful one is Sunset Splash, a sweet blend of white wine, apple and cherry with flavors of pineapple, mango and lemon. Also popular is Hallowine, an apple and mulled-spice blend, which is offered for a limited time. Try warming this one, as well as the Mulled Christmas Wine, before serving, Jesse advises. Jesse and other Winery staffers are excited about soon bottling wine, made from their own harvested grapes on a five-acre plot just south of Carlsville. Expect to taste something different from these hybrid grape vines that tolerate a Wisconsin winter freeze. An example is LaCrosse (which we love), which will produce a dry white wine that’s incomparable to other wines, the owners say. The Winery also makes it simple for people to purchase the wines year-round. 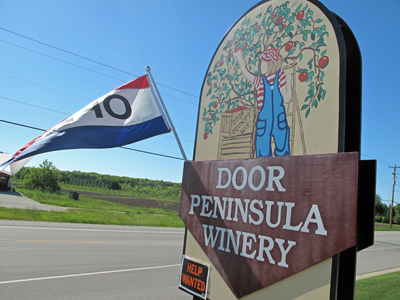 Through wholesale relationships, the Door Peninsula Winery brand is on the shelves in grocery stores and retail outlets throughout Wisconsin, Illinois and in Minnesota as well. Or you can even join their Wine Club! Door Peninsula Winery is also a site for events such as educational programs on wine pairing and tasting. The Winery has won a number of awards over the years as well! they also have their Door County Distillery on the grounds, producing some unique vodka, whiskey and gin! So tour the Winery, and after you have a taste and bought a bottle or two, please tell them DoorCountyNavigator.com got you there - that helps keep this website alive & well . . . for you!